Vaping: it’s become a cool alternative to smoking. Proponents of vaping say it’s less hazardous to health, less addictive, cheaper, and leaves less residue than smoking. While it’s true that vaping is a different beast than smoking cigarettes, dentists everywhere are warning that it can have a whole host of detrimental effects on your oral health. From stained teeth to infections of the mouth and gums, vaping has a series of dental side effects you should be aware of. Although vaping is better for bystanders (it doesn’t produce second-hand smoke like tobacco), it doesn’t offer any dental health benefits for people who do it. 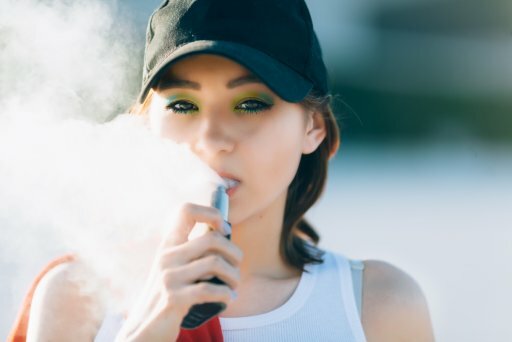 Because vaping still brings users into close contact with nicotine products, it has the potential to reduce blood flow in the mouth, restricting the overall supply of nutrients and depriving the soft tissues in the mouth of oxygen. This same oxygen deprivation causes gum recession, over time. Furthermore, e-cigarette vapors cause the gum tissue to release inflammatory proteins, which can result in oral disease like periodontitis. Finally, reduced blood flow throughout the oral tissues inhibits the mouth’s ability to fight bacteria, which leads to increased decay and other dental problems. Over a long period, vaping can cause tooth loss and similar issues. What’s the Difference Between a Vape and a Cigarette? While conventional cigarettes produce smoke, vaping uses an e-cig mechanism that creates vapor. Vape pens work by heating this “vape juice” with an internal heating element. This heat, in turn, vaporizes the nicotine and other elements and produces the vapor that the user inhales. Initially, producers of vape pens believed that, since the units don’t produce smoke, that they would be healthier for users and bystanders. Vaping may produce some benefits for bystanders, but it’s every bit as dangerous to your oral health as smoking traditional cigarettes. While not everyone who vapes will get gum disease, it’s smart to be aware of the risks and to protect your dental health by avoiding it altogether. Want to learn more about vaping and how to avoid stained teeth and damaged oral health? Contact our team today to schedule your annual check-up. Sign up for the latest notifications. Be the first to know about services, announcements and news from Orange Beach Family Dentistry!